With the opening of NFL training camps less than a month away, there are still a few intriguing free agents floating around. Players such as Dez Bryant, DeMarco Murray, and even Adrian Peterson are out there to be had. But even with that, for all intents and purposes the book on the 2018 free agency class has been written. Today, we turn our eyes down the road, with a quick-hit look at the players who are heading into their walk year and could be next offseason’s hot free agency names. Some big names and their potential landing spots will alter the landscape of fantasy football once again. Here’s a look at some of the more interesting players and whether they will hit the market or possibly remain with their current teams. This will be a one-and-done season in Cleveland for the veteran Taylor. With 2018 No. 1 overall draft selection Baker Mayfield as the quarterback of the future for the Browns, Taylor will use this season to show case his skills for a QB-needy team in 2019. Over the last three seasons Taylor has accounted for 65 total touchdowns with just 21 turnovers and has regularly posted QB2 fantasy numbers. There will be a market for that type of production and a spot on fantasy rosters as at least a bye-week/depth selection. With Carson Wentz on track to be ready for the start of the season, Foles returns to a backup role. The Cinderella run he put together in 2017 was a great story but doesn’t necessarily help his fantasy value despite how well he played. The Eagles will not franchise a backup quarterback heading into 2019 unless Wentz were to get hurt again. While Foles thrived in the Doug Pederson offense last season that he first learned as a backup in Kansas City, he has finished as a top-25 fantasy QB just once in his six years in the league. The Steelers have franchised-tagged Bell for the second consecutive season. Unless a deal gets done, it’s likely he remains away from the team until just prior to the start of the season. It’s unlikely that Pittsburgh would place the franchise tag on Bell for a third time as the price tag would likely be in the $20 million range. 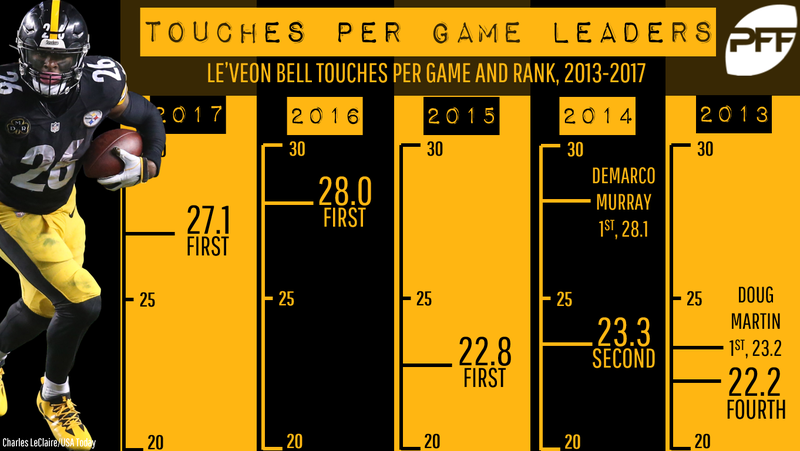 Coming off a season in which he had more than 400 touches it will be interesting to see if Pittsburgh repeats that level of usage for Bell in 2018. If they do, that could be a sign they intend to move on from Bell and address the position via the draft or free agency, or with 2017 draft pick James Conner. As the consummate dual threat out of the backfield Bell would remain a top-three fantasy selection in 2019 regardless of the team he signs with. It would be a major surprise if Johnson is not a member of the Cardinals in 2019. According to Pro Football Talk, the organization has already spoken of looking forward “rewarding” Johnson and that’s he a “core player” that they want to have for the “long term.” Even if the two parties cannot reach an agreement the Cardinals are likely to place the franchise tag on Johnson with no current replacement option in house. Ingram put up career highs in rushing yards (1,124), receptions (58), receiving yards (416), and total touchdowns (12). However, it’s not an ideal way to enter your contract year serving a four-game suspension for violating the league’s PED policy, which is where Ingram finds himself. The Saints will look to feature Alvin Kamara more with Ingram out and he well may establish himself as a three-down back. Ingram will be 29 years old entering the 2019 season and will likely test the free agent market as the Saints have their back of the future (and present) in Kamara. Ajayi seemed rejuvenated after the midseason trade to the Eagles last year. In the seven regular-season games he played for Philadelphia Ajayi averaged 5.8 yards per carry while hauling in 10 passes for 91 yards and scored a pair of touchdowns. With LeGarrette Blount out of the picture Ajayi will assume the early-down role for Philadelphia and the chance to secure the role moving forward. The passing downs will be dominated by veteran Darren Sproles and Corey Clement. Should Ajayi continue the solid play he displayed down the stretch last season the Eagles will likely work out a long-term deal, as he’ll be just 27 years old in 2019. The floor for Ajayi would be RB3 with a ceiling of solid RB2 production. Let’s keep this one short and sweet. A healthy Beckham was a top-five fantasy option in his first three seasons, putting up 35 touchdowns. If the Giants can’t reach a long-term deal with Beckham, then they will certainly put the franchise tag on him. Beckham will remain in New York as well as remain a top-five fantasy option at WR. This is another simple one. After posting three straight seasons with at least 100-receptions and six touchdowns Fitzgerald decided he would return for the 2018 season. The Cardinals will allow Fitzgerald to determine his own fate once again following the season as he’s earned that right. Fitzgerald has posted WR2 or better totals in standard 12-team scoring formats 11 times during his career. Look for Fitzgerald to either be a Cardinal once again or retired in 2019. Since joining the Lions in 2014, Tate has been the model of consistency, leading the team in receptions each year and never posting fewer than 90. Tate has also racked up 19 touchdowns over that time finishing with WR2 numbers in standard scoring formats three times. The consummate slot receiver, Tate graded out as the seventh-best WR last year according to PFF and led all receivers in missed tackles with 23. While he will be 31 years old entering the 2019 campaign, Tate is currently riding a streak of starting 95 straight games dating back to 2012. Look for the Lions and Tate to hammer out an extension as there is no other slot option on the roster. Los Angeles acquired Cooks via trade from the Patriots in April, making this his third team in the last three seasons. Cooks has surpassed 1,000 receiving yards and at least seven touchdowns in each of those seasons. Those numbers are good enough for a top-12 finish in most 12-team standard scoring formats. Look for the Rams to work out an extension with Cooks or place the franchise tag on him prior to the 2019 season. He will remain in Los Angeles with a floor of WR2 production with WR1 potential. You know it’s a weak class of free agents at a position when a player who will be 35 years old in 2019 leads the group. To be fair though, Walker has been a bit of a late bloomer as he didn’t crack the 30-plus receptions or six-touchdowns plateau until his age-29 season in 2013. Since then Walker has put up TE1 totals for five straight seasons. The Titans are hoping that Jonnu Smith is their TE of the future but should make a play to keep the highly productive veteran in house until Smith proves he can step up. This is another simple situation to decipher. It’s all about the health status regarding Eifert and his back injury. As of this writing it’s still uncertain if Eifert will be ready for training camp with the ongoing issue. Since posting 13 touchdowns in 2015 Eifert has played just 10 games and put up five touchdowns. The Bengals do have Tyler Kroft and C.J. Uzomah in house — the duo combined for 52 receptions and eight scores last season. Unless he proves that he can put in a full season and stay healthy in 2018 Eifert will likely be allowed to walk in free agency.